I have the same sunglasses!! However, I love the colour of the sweater… so bright! That cuff is incredible. I also love that sweater! Amazing blog! I like so much! Absolutely gorgeous!Love the outfit and the pics! WOow AND these long brown gloves (already) make all the difference in terms of “day-to-day GLAMazon-ittude” Here I can’t help BUT say (§ widely approve) Dear !!! I love the sweater and the bag. Love the cuffs and the parrot green! This has become one of my fav blogs! I love the long leather gloves with the gold cuffs!! So cute! fabulous! Perfect mix of colors! This is such a classic look! So you, sophisticated as always! Love your sweater! The color is gorgeous! Very cool! Coat is excellent! A very classic and ladylike look! In love with this green sweater! You look great! I love this outfit! Very ladylike glamour! Great style. i love the green fluffy sweater, seems so cosy. Perfect outfit! i really love the sweater! That double cuff love is MAJOR!! So gorgeously gilded, but eyes go straight for it! Classic chic look! Brilliant! so cute!!! i’m so loving your blog, you have a new follower!! pictures are beautiful!!! you look perfect! You look so gorgeous! Green is a lovely color on you. You look gorgeous doll! 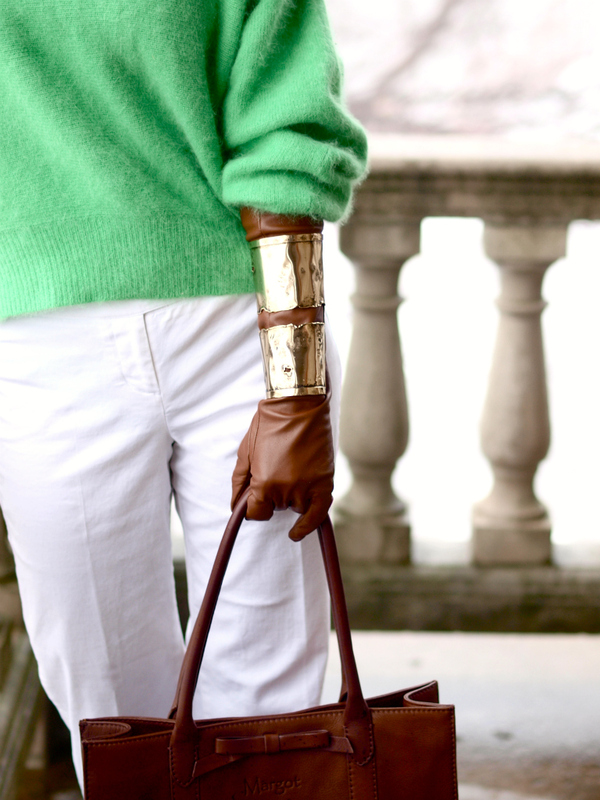 I love the double cuff and the color and texture of that sweater is gorgeous! It looks really good paired with the earthy browns and the crisp white. Love it! 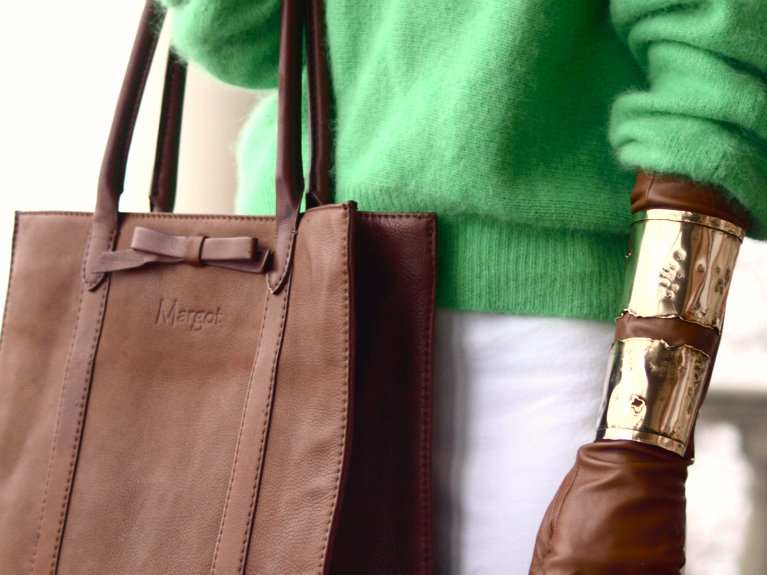 I love how the cuff looks over your leather gloves. So chic! This is the best you’ve looked lately,in love!The sweater is to dye for and styled with white pants and brown gloves perfection!You look amazing on the pics!Love the location! great blog, i am now following. Perfect outfit as always ! I love your arm cuffs and the nice sweater! You look amazing..I love your outfit you look so chic! You look amazing! I love your outfit you look so chic! I love your weater is beautiful. Wow, this is so gorgeous. I love the cuffs over your gloves — so perfect and also adore these vibrant colors! I’m your newest follower and loving your style. 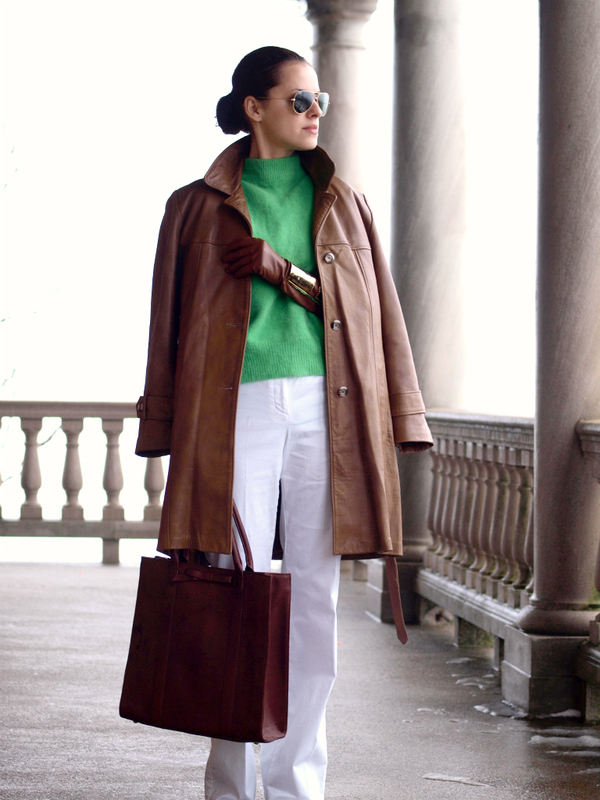 I adore the color and collar on the sweater-it works so well with the color of the jacket! Thanks so much for visiting my blog! I love your blog-you have such great style! I’m following you! I really like these colors! Very elegant and restrained! Loving those gloves, such a cool touch. Lovely, I really like how you wear those cuff over your gloves, amazing !!! Love your sense of styling !!! Really….WOW! Amazing, simple but perfect :) I don’t know why but it looks sssooooo glamorous! Stop by – Where are my keys? Wow, that ouftit is just AMAZING. Awesome cuff! Also loving the green sweater! It’s a very nice outfit. So elegant and absolutely chic. Very chic, lady-like look! However two cuffs add unexpected, futuristic twist!Personally I like this look a lot! I love the color of your sweater. Kisses. That sweater is a dream and the combination with gloves is perfect! I love it, it’s so succinctly and with style! I like this sweater, it looks soft and nice. Lovely sweater, and the gloves are so chic!! Oh you have great blog and amazing style!! Brilliant! You look fab in that outfit. Very clever indeed to put those golden bangles. So polished! You look awesome! Oh my!That sweater is perfection all the ways! double cuff completes the whole look! awesome! beautiful colours and I`m in love with your sweater! most amazing jewelry I’ve seen in a long time…. This might be my favorite look until now, there is something that reminds my on the Old Hollywood!! Stunning my girl, stunning!! Este outfit es de 10! Estas increíble! amazing combination once again!! !green looks great on you!kisses! I’m hopelessly conquered by this oufit! You look just perfect! In my opinion, it’s one of the best of yours.